The Iowa Barnstormers were defeated by the Chicago Rush 61-43 in their home opener before a record crowd of 12,184. The Rush took the lead early off a Brian Villanueva interception and Iowa eventually saw themselves in a 17-0 hole. Villanueva was then replaced by AFL veteran Ryan Vena who was able to get the Barnstormers back in the game. Vena lead Iowa to three second quarter touchdowns bringing the score to a 34-22 Rush lead. Todd Blythe had the highlight of the first half when he made a leaping catch in the end zone while being pushed over the boards by Chicago defenders for a Barnstormers touchdown. The reception was named the Cutter’s Catch of the Week by the AFL. In the second half, the Barnstormers came out and played even with Chicago being outscored by only six points in the half. Tim Dodge, Blythe and Vena all had second half touchdowns which brought the deficit to only 10 points. However, Iowa came up short of overtaking the Rush and look to bounce back on the road in Week 3. The Barnstormers defense showed their potential in the game by recording one interception and recovering three fumbles. Micah King and Mike Lewis combined for two sacks for negative 10 yards. 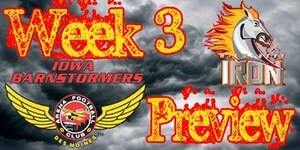 The Barnstormers travel to the Bradley Center in Milwaukee, Wisconsin this week to take on the Milwaukee Iron. Milwaukee started the season strong with a victory in Week 1 against the Spokane Shock. Both Milwaukee and the Barnstormers spent their second week of the season on a bye so both teams should be well rested for this divisional showdown. Milwaukee had a strong off-season brining in talented players including Chris Greisen at quarterback and Nate Forse at wide receiver. Along with building up the roster, the Iron brought in former head coach for the Green Bay Blizzard Bob Landsee, which should make for a very high action game. Both teams played in the former af2 last season and are looking to make a big impact in the new AFL. -This is the third meeting between the Milwaukee Iron and the Iowa Barnstormers, the first in the AFL. The Barnstormers lead the series 2-0. In the first week of being in the AFL, Jason Simpson picked up where he left off last season in the af2 making big tackles and causing turnovers on the opposing team. Simpson has always been a threat in the defensive backfield and has proven it already with an interception for 14 yards against Chicago. Simpson was named Ironman of the Game during Week 1 and was nominated for league Ironman as well. The Iowa Barnstormers return home on April 24 to take on the Oklahoma City Yard Dawgz at Wellmark Field in Wells Fargo Arena. Please note this game will start at 8:05pm and will be broadcast live on the NFL Network! Tickets start at just $15 a seat; call the Barnstormers Front Office TODAY: 515-633-2255!